A cute little bullfrog sits quietly on a log in the Laurentian Forest at the Bioddome de Montreal in Montreal, Quebec. Atop a log in the habitat of the Laurentian Forest at the Biodome de Montreal in Montreal, Quebec a bullfrog sits motionless as visitors pass by. Life is spectacular for a bullfrog at the Biodome de Montreal as they reside with other species which are no threat to them. Bull Frog, Rana catesbeiana, in the Laurentian Forest at the Biodome, Biodome de Montreal, Hochelaga-Maisonneuve, Montreal, Quebec, Canada. 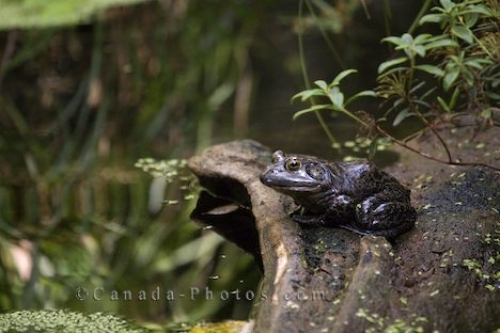 Picture of a bullfrog in the Laurentian Forest at the Biodome de Montreal in Hochelaga Maisonneuve, Quebec in Canada.